"Stop lying about my record," the Kansas senator once told his Republican presidential primary opponent. A son of Dust Bowl Kansas whose family was nearly broken by the Depression, Dole barely escaped death from an exploding artillery shell in World War II, then spent the next three years rehabilitating in an Army hospital. He emerged without the use of his right arm and with shrapnel still in his body, returned to western Kansas and entered politics. In 1960, he won a House seat. Eight years later, he moved up to the Senate. It made him a rising star in Republican politics. Bush, by contrast, was born into an aristocratic Yankee family and his father, Prescott, was a U.S. senator. Like Dole, Bush defied death in World War II, shot down over the Pacific Ocean but avoiding capture by the Japanese, then set out to make his own name in Texas, first in the oil business and eventually in politics. He lost a Senate race in 1964, but won a House seat two years later. It made him the first Republican ever to represent Houston in Congress — and, just like Dole, a rising Republican star. Their collision was almost inevitable, and it came in 1972, just weeks after Richard Nixon's landslide reelection. Dole had been serving as the chairman of the Republican National Committee, an invaluable platform for a would-be national candidate, but his outspokenness had irked the White House. Nixon wanted to make a change, and he had someone in mind: Bush, who at the White House's insistence had given up his House seat for another Senate bid in 1970. When he fell short in that race, Bush was named U.N. ambassador by Nixon, and now Nixon wanted him to head the RNC. The switch was announced — and universally portrayed as a blow to Dole and a major boost for Bush. 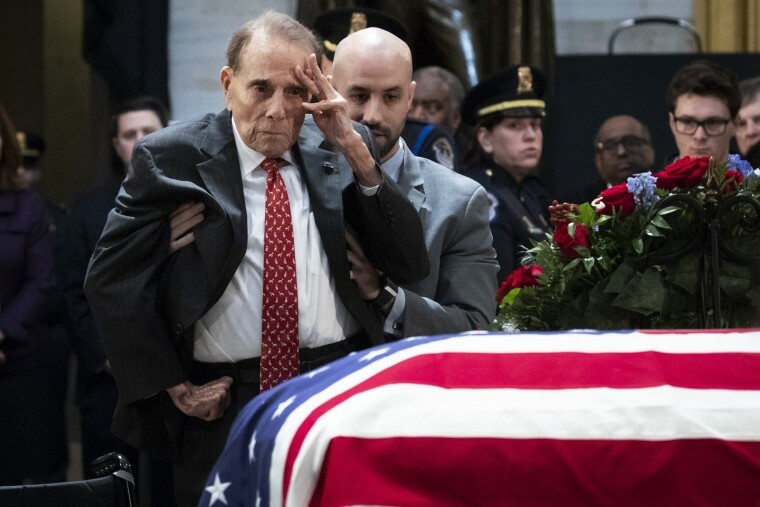 Journalist Martin Schram, detailing the ways the outgoing chairman had alienated himself from the White House, concluded: "There is a lesson for the 48-year-old George Bush in the case of the 49-year-old Bob Dole." Nixon's demise complicated each man's path. Public disgust over Watergate almost cost Dole his seat when he ran for reelection in 1974 and eked out a one-point victory. Bush, meanwhile, hoped to win an appointment as the new vice president under Gerald Ford, Nixon' successor, but Ford passed him over in favor of Nelson Rockefeller and Bush settled for the lower-wattage role of ambassador to China. At the Republican convention in 1976, though, Ford needed a new No. 2. He was running for a full term and Rockefeller was too liberal for the conservative wing of the GOP. Bush was an obvious choice, but there was a problem. At the end of 1975, Ford had nominated him to head the CIA, and the Senate Armed Services Committee had threatened to hold up his confirmation unless Bush was ruled out as a potential V.P. pick. It was, Ford said, an "unfortunate and tragic" situation, but he complied and Bush was confirmed. For Dole, it was a stroke of fortune as Ford instead turned to him as a running-mate. All at once, Dole regained the stature he'd lost a few years earlier. As the vice presidential nominee, he received a national security briefing just after the convention. It was administered by Bush, the CIA director, who could only wonder if he'd been lapped for good by his rival. When the Ford-Dole ticket fell inches short in the 1976 election, Dole went to work parlaying his new prominence into a national campaign of his own, for president. Bush, out of a job with Ford's defeat, decided to run in 1980, too. They were both underdogs against the frontrunner, Ronald Reagan, but it was Bush, not Dole, who found traction and posted a stunning upset win in the Iowa caucuses. The scene was set for a Reagan-Bush showdown in New Hampshire, but Dole remained in the race. When the two leading candidates scheduled a debate in Nashua, Dole and the other also-rans showed up and walked on stage as it started. Bush didn't want them there but Reagan did, and he began arguing for their inclusion. The moderator interrupted him and demanded Reagan's microphone be cut. "I am paying for his microphone, Mr. Green!" Reagan roared. It brought the crowd to its feet as Bush just sat there, a silent witness to the destruction of his own campaign. According to Richard Ben Cramer’s "What it Takes," Dole leaned in to Bush as he exited the stage and said, "There'll be another day, George." Reagan won New Hampshire, and the nomination, with ease. Bush caught the big break in '80. His surprising strength in the primaries convinced Reagan to add him to his ticket, and unlike the Ford-Dole ticket, Reagan-Bush proved a big winner that fall, and again in 1984. Two terms as Reagan's loyal vice president made Bush a natural candidate for the top job in 1988. But Dole still wanted it too, and he'd made moves of his own in the Reagan years, ascending to the top Republican leadership post in the Senate. He set out to challenge Bush for the nomination and this time crushed him Iowa, where Bush fared so dismally that he even finished behind televangelist Pat Robertson. The race moved to New Hampshire and Dole, improbably, had his rival on the ropes. Bush responded with a last-minute barrage of negative ads that accused Dole of being soft on taxes, and gutted out a pivotal victory. The exchange did serious harm to Dole's public image, locking in an impression of him as a glowering sore loser that took years to shake. That night in New Hampshire also marked the point at which Bush left Dole behind for good in their race to the top. He won every remaining primary, captured the GOP nomination, and was elected president in the fall. Dole, for his part, returned to the Senate, where he made himself a reliable point-man for the Bush administration. If there were hard feelings from all the years before, he never let it show, and the competitive enmity between the two men morphed into something quite different: genuine respect. Bush was defeated for reelection in 1992 by Bill Clinton, and a few days later Dole hosted a tribute dinner for Bush. He got up to speak and choked up: "The best man didn't win on Election Day." Bush was just as generous toward Dole, who with Bush's loss became the highest-ranking Republican left in Washington. Dole continued to chase the presidency, but the rivalry was now over. At the 1996 Republican convention that nominated Dole, Bush delivered a speech enthusiastically supporting him, and the former president — along with his son, George W. Bush — accompanied Dole in the final days of his doomed campaign. Ironically, George W. Bush would four years later outpace Dole's wife Elizabeth, for the GOP nomination, but the bitterness between the families was gone. All that was left, all these years later, was that final salute, delivered this week in Washington.